Scars are a natural part of the healing process. When the skin is injured, the body sends a repair team to close the wound and create new skin. When this process happens in the deeper dermis layer, natural collagen is used to generate new skin with a different color and texture – a scar. 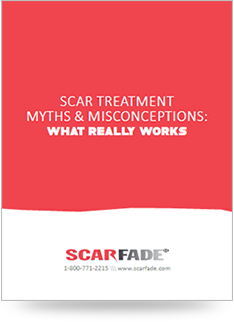 Scars are often pink or red and slightly raised, later turning pale and flattening with age. Anytime the skin is injured, there is a chance for scarring to occur. Possible causes of wounds include scrapes, cuts, surgical incisions, acne and burns. How well the wound heals impacts the scar formation. Depending on the type, depth and location of the wound, scars can be large and wide or small and thin. Scars that form over joints and limit mobility are called contracture scars. Thick, red or purple raised scars sometimes form on various parts of the body. These are called hypertrophic scars. If they outgrow the original wound area, they are referred to as keloid scars. Hypertrophic and keloid scars are the most prominent types of scars and may never completely go away.